Protologue: Bull. Jard. Bot. Etat 32(2): 216 (1962). Pericopsis elata occurs from Côte d’Ivoire east to the Central African Republic and DR Congo. It has been introduced in western Uganda. The wood (trade names: afrormosia, assamela, kokrodua) is highly valued on the international market, mainly for furniture and as decorative veneer, but also for interior and exterior joinery, stairs, flooring and boat building. It is considered a substitute for teak. It is also suitable for heavy and light construction, railway sleepers, vehicle bodies, interior trim, handles, ladders, agricultural implements, sporting goods, musical instruments, toys, novelties, boxes, crates, carvings, turnery and draining boards. In traditional medicine in Congo pulped bark is rubbed into scarifications as an anodyne. Exploitation of Pericopsis elata for the international trade started in 1948 in Ghana, soon followed by Côte d’Ivoire. The wood was an important export commodity from Ghana, but excessive exploitation has drastically reduced the numbers of exploitable trees. In 1966 Ghana exported 8600 m³ of logs and 19,600 m³ of sawn wood, in 2001 only 150 m³ of logs. In the same year Côte d’Ivoire was the main exporter with 68,000 m³ of logs and 15,000 m³ of sawn wood. More recently, Cameroon, Congo and DR Congo have become the main exporters, with only small volumes exported from Côte d’Ivoire and Ghana. Cameroon exported 13,000 m³ sawn wood in 2003, 7500m³ in 2004 and 6200 m³ in 2006. Congo exported 3000 m³ of sawn Pericopsis elata wood in 2003 at an average price of US$ 371 per m³, and in 2004 the export volume was 5000 m³ at an average price of US$ 324 per m³. 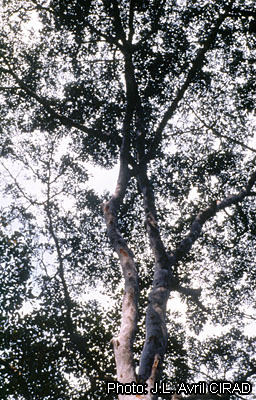 Pericopsis elata is among the four most important timber species in Congo. 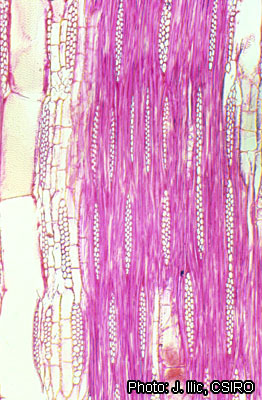 The heartwood is yellowish brown to greenish brown with darker streaks, fairly distinctly demarcated from the pale yellow-brown, up to 3 cm wide sapwood. The grain is straight, sometimes interlocked, texture moderately fine. Quartersawn surfaces are mottled. The wood resembles that of teak, but lacks the oily texture. The wood is moderately heavy, with a density of (620–)700–800 kg/m³ at 12% moisture content. The wood air dries slowly and with little degrade; it can be kiln dried under moderate schedules with good results. The rates of shrinkage are moderate, from green to oven dry 3.0–3.7% radial and 5.8–7.0% tangential. Once dry, the wood is very stable in service. At 12% moisture content, the modulus of rupture is 93–155 N/mm², modulus of elasticity 9450–13,300 N/mm², compression parallel to grain 63–71 N/mm², shear 9–16 N/mm², cleavage 17–24 N/mm and Janka side hardness 6940–7115 N.
The wood saws and works well with both hand and machine tools. However, the blunting effect is fairly high and stellite-tipped saw teeth and tungsten-carbide-tipped cutting tools are recommended. The wood has a smooth finish and usually planes well, but sometimes with a slight picking up due to the presence of interlocked grain; a cutting angle of 20° is advised. It polishes satisfactorily, but the use of a filler is recommended. The wood is liable to splitting when nailed, but it holds nails and screws well; pre-boring is recommended. Gluing does not pose problems when it is done carefully to prevent staining. The bending properties are moderate. The wood must be well steamed for veneer production. It turns satisfactorily. The wood is very durable, but may occasionally be attacked by marine borers. The heartwood is resistant to impregnation by preservatives, the sapwood fairly permeable. Wood dust may cause irritation to the nose, throat and eyes. Under moist conditions, the wood often stains dark where it is in contact with iron. Methanol extracts of the leaves showed moderate in-vitro antiplasmodial activity against multiresistant strains of Plasmodium falciparum. The wood contains stilbene derivatives with antibiotic, antimalarial and blood-sugar reducing properties. They also play a role in the colour development of the wood. Medium-sized to large tree up to 45(–50) m tall; bole branchless for up to 30(–35) m, straight and cylindrical, sometimes twisted, up to 130(–150) cm in diameter, often with low and blunt buttresses; bark surface creamy or greyish, flaking in thin pieces leaving red-brown patches, inner bark yellowish, darkening to dirty orange; crown flat-topped, with massive, spreading branches; branchlets drooping, glabrous. Leaves alternate, imparipinnately compound with (5–)7–9(–11) leaflets; stipules linear, c. 7 mm long, caducous; petiole and rachis together 7–20 cm long, slightly grooved on upper surface; stipels thread-like, 2–5 mm long, persistent; petiolules 3–7 mm long; leaflets alternate, elliptical to ovate-elliptical, 3–8 cm × 1.5–3.5 cm, terminal one largest, slightly cuneate to rounded at base, shortly acuminate at apex, glabrous, pinnately veined with 5–11 pairs of fine veins. Inflorescence a slender, drooping panicle up to 12 cm long at the end of a shoot, sparsely hairy; bracts up to 4 mm long. Flowers bisexual, papilionaceous, white to creamy or greenish; pedicel 5–9 mm long, slender; calyx campanulate, 6–12 mm long, with large triangular lobes, finely hairy; corolla with nearly circular standard 11–13 mm in diameter, clawed, wing and keel petals c. 15 mm long; stamens 10, free, 9–19 mm long, glabrous; ovary superior, flattened, 5–6 mm long, hairy, style slender, upcurved. Fruit an oblong-linear, flattened pod 7–17 cm × 2.5–3 cm, shortly stiped, slightly winged along margins, brown, smooth, reticulately veined, indehiscent, 1–4-seeded. Seeds disk-shaped, 12–15 mm in diameter, brown. Seedling with epigeal germination; hypocotyl 1–2 cm long, epicotyl 4–5 cm long; cotyledons ovate, c. 12 mm long, slightly fleshy; first 2 leaves opposite, simple, next leaves alternate and 3-foliolate. Pericopsis comprises 4 species, 3 of which occur in tropical Africa and 1 in tropical Asia. 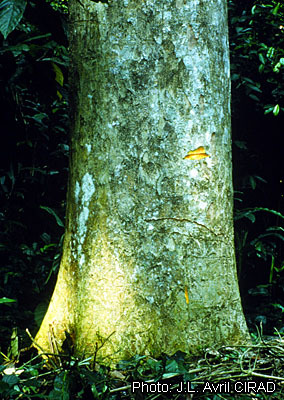 The latter, Pericopsis mooniana (Thwaites) Thwaites, was heavily exploited for its valuable timber in South-East Asia, but stands have been depleted in many regions. Vessels: 5: wood diffuse-porous; 13: simple perforation plates; 22: intervessel pits alternate; (23: shape of alternate pits polygonal); (25: intervessel pits small (4–7 μm)); 26: intervessel pits medium (7–10 μm); 29: vestured pits; 30: vessel-ray pits with distinct borders; similar to intervessel pits in size and shape throughout the ray cell; 41: mean tangential diameter of vessel lumina 50–100 μm; 42: mean tangential diameter of vessel lumina 100–200 μm; 47: 5–20 vessels per square millimetre; 58: gums and other deposits in heartwood vessels. 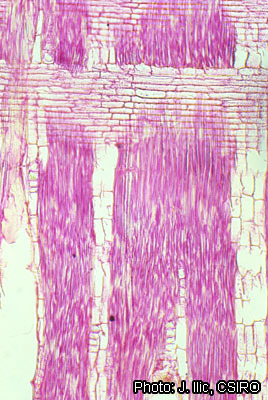 Tracheids and fibres: 61: fibres with simple to minutely bordered pits; 66: non-septate fibres present; 69: fibres thin- to thick-walled; 70: fibres very thick-walled. Axial parenchyma: (76: axial parenchyma diffuse); 78: axial parenchyma scanty paratracheal; 79: axial parenchyma vasicentric; (80: axial parenchyma aliform); (81: axial parenchyma lozenge-aliform); 83: axial parenchyma confluent; 84: axial parenchyma unilateral paratracheal; (89: axial parenchyma in marginal or in seemingly marginal bands); 92: four (3–4) cells per parenchyma strand. Rays: 97: ray width 1–3 cells; 104: all ray cells procumbent; (106: body ray cells procumbent with one row of upright and/or square marginal cells); 115: 4–12 rays per mm. Storied structure: 118: all rays storied; 120: axial parenchyma and/or vessel elements storied. Mineral inclusions: 136: prismatic crystals present; 142: prismatic crystals in chambered axial parenchyma cells. Initial growth may be rapid in suitable conditions, with young trees attaining 8 m tall with a bole diameter of 9 cm after 7 years and 26 m tall in 16 years. Plantation trials in Côte d’Ivoire showed growth rates up to 20 cm in bole diameter in 20 years. Saplings tend to have a spreading, bushy habit. In Ghana trees flower in April–May and fruit in August–November. Seedlings are usually found close to mother trees, up to a distance of 35 m, indicating that the non-dehiscing pods are spread over only short distances, although they may occasionally be spread over longer distances by strong winds. The roots have nodules containing nitrogen-fixing bacteria. Pericopsis elata is characteristic of semi-deciduous forest, especially in swampy and flat, disturbed localities. It occurs in regions with 1000–1500 mm annual rainfall. The 1000-seed weight is 200–450 g. Although seed production is often abundant, lack of natural regeneration has often been reported. The seeds of Pericopsis elata germinate rapidly, in about 8 days, both in deep forest shade and in small gaps in the forest, but the seedlings only develop in the gaps and die in the deep shade. In full sunlight the germination rate is very low, only about 5%. Localities where seedlings receive full sunlight in the morning but which are shaded from direct midday sun have been recorded as ideal for seedling growth. The seedlings are remarkably drought tolerant and can be found on wet as well as dry forest soils. Sowing tests showed that seedlings grow best when the seeds have been covered with 1.5 cm of soil. In experiments, propagation by stem cuttings showed good results. In a nursery experiment in Ghana, the application of NPK fertilizer showed positive results on seedling growth, but the potting medium (pure compost or compost mixed with up to 50% sand) had no influence on seedling growth. In Ghana and DR Congo Pericopsis elata has been successfully used in small-scale enrichment planting (line and group planting) as well as in taungya and pure plantations. For trees in natural forest, the minimum felling diameter is 50 cm in Côte d’Ivoire, 60 cm in DR Congo, 100 cm in Cameroon and 110 cm in Ghana. Larvae of the moth Lamprosema lateritialis have been recorded as a pest of seedlings and young trees. The effects of defoliation by this insect can be serious and can cause high rates of seedling mortality. 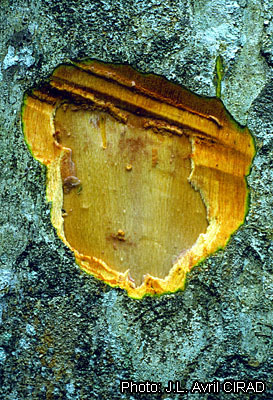 In some localities in Ghana, the fungus Beauveria bassiana was identified as a natural enemy of Lamprosema lateritialis. 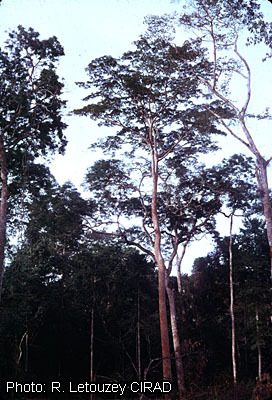 In Ghana there is a minimum felling limit of 110 cm in diameter for Pericopsis elata, but even then logging is only allowed with a permit. In Cameroon the minimum diameter limit for Pericopsis elata is 100 cm, but it has been recommended that this be reduced to 80 cm to relieve the pressure on lower diameter classes, which are cut indiscriminately and illegally due to the lack of trees with a bole diameter over 100 cm. In Congo the minimum exploitable diameter limit is set at 60 cm. In several countries (Ghana, Nigeria, Cameroon) the export of logs has been banned, and logs are processed within the country of production. In Cameroon parquet flooring is an important product for export. Pericopsis elata is included in the IUCN Red List of threatened species as endangered, as a result of habitat loss and degradation and ongoing exploitation. It is listed in CITES Appendix II because it may become threatened with extinction unless trade is closely controlled. International trade may be authorized by the granting of an export permit in the country of production. In Côte d’Ivoire, Ghana and Nigeria Pericopsis elata is seriously threatened due to forest fragmentation and selective logging and in Cameroon due to illegal logging. The largest remaining stands are located in northern Congo and northern DR Congo, whereas there is no information on the status of Pericopsis elata in the Central African Republic. Selection for plantation development has been undertaken in Ghana. Pericopsis elata produces one of the most highly valued timbers of tropical Africa. The large-scale selective exploitation has resulted in serious reduction of populations, whereas the remaining larger populations are still under much pressure. Although the critical status of Pericopsis elata has been recognized by including it in international and national lists of threatened species, protection is still not adequate. There is still too little information on growth rates, propagation and appropriate management techniques to develop models for sustainable exploitation. More research is needed before measures can be taken to allow harvesting of this species on a sustainable basis without threatening it with extinction. Growth rates seem to be too slow to establish economically viable timber plantations, also because only the heartwood is highly valued, and the sale of material early in the rotation cycle is unattractive because this mainly consists of sapwood. In Ghana it has been concluded that any future efforts to establish plantations of Pericopsis elata must address the problem of defoliation by Lamprosema lateritialis. Sustainable exploitation from natural forest seems to be the only option for saving this valuable African timber for the future, but very long cutting cycles and thus very low production levels may be necessary. CIRAD Forestry Department, 2003. Afrormosia. [Internet] Tropix 5.0. http://tropix.cirad.fr/africa/afrormosia. December 2007. Gérard, J., Edi Kouassi, A., Daigremont, C., Détienne, P., Fouquet, D. & Vernay, M., 1998. Synthèse sur les caractéristiques technologiques des principaux bois commerciaux africains. Document Forafri 11. Cirad, Montpellier, France. 185 pp. Howland, P., 1979. Pericopsis elata (Afrormosia). Commonwealth Forestry Institute Occasional Papers 9, Oxford, United Kingdom. 19 pp. Ackah, J.R., 1997. Seedling shadows of Pericopsis elata, a commercially endangered timber species. B.Sc. Natural Resources Management degree thesis, Institute of Renewable Natural Resources, Kwame Nkrumah University of Science and Technology, Kumasi, Ghana. 43 pp. African Regional Workshop (Conservation & Sustainable Management of Trees, Zimbabwe), 1998. Pericopsis elata. In: IUCN. 2007 IUCN Red list of threatened species. [Internet] http://www.iucnredlist.org. December 2007. Agyili, J. & Adam, A.R., 1996. Effect of sowing depth on the germination of seeds and initial growth performance of seedlings of Pericopsis elata (Harms) van Meeuwen. Ghana Journal of Forestry 2: 36–38. Ajaiyeoba, E., Ashidi, J., Abiodun, O., Okpako, L., Ogbole, O., Akinboye, D., Falade, C., Bolaji, O., Gbotosho, G., Falade, M., Itiola, O., Houghton, P., Wright, C. & Oduola, A., 2004. Antimalarial ethnobotany: in vitro antiplasmodial activity of seven plants identified in the Nigerian Middle Belt. Pharmaceutical Biology 42(8): 588–591. Appiah, B.K., 1994. Initial growth performance of Pericopsis elata in different potting media and fertilizer treatments. B.Sc. Natural Resources Management degree thesis, Institute of Renewable Natural Resources, Kwame Nkrumah University of Science and Technology, Kumasi, Ghana. 49 pp. Asare, A.E., 1994. The effect of different levels of chemical fertilizer (NPK) on the initial growth performance of Pericopsis elata seedlings. B.Sc. Natural Resources Management degree thesis, Institute of Renewable Natural Resources, Kwame Nkrumah University of Science and Technology, Kumasi, Ghana. 42 pp. Atuahene, S.K.N., 1996. Effects of defoliation on Pericopsis elata (Harms) van Meeuwen by the leaf tying moth, Lamprosema lateritialis Hampson (Lepidoptera: Pyralidae). Ghana Journal of Forestry 2: 1–5. Atuahene, S.K.N. & Teyegaga, A., 1979. The pathogenicity of Beauveria bassiana (Bals.) Vuill. on larvae of Lamprosema lateritialis Hamps. (Lepidoptera: Pyralidae), a pest of afrormosia in Ghana. Bulletin of African Insect Science 3: 12. Burslem, D.F.R.P. & Miller, J., 2001. Seed size, germination and seedling relative growth rates in three tropical tree species. Journal of Tropical Forest Science 13(1): 148–161. Kyereh, B., Swaine, M.D. & Thompson, J., 1999. Effect of light on the germination of forest trees in Ghana. Journal of Ecology 87: 772–783. Sayer, J.A., Harcourt, C.S. & Collins, N.M. (Editors), 1992. The conservation atlas of tropical forests: Africa. International Union for Conservation of Nature and Natural Resources. Macmillan Publishers, United Kingdom. 288 pp. Toussaint, L., Wilczek, R., Gillett, J.B. & Boutique, R., 1953. 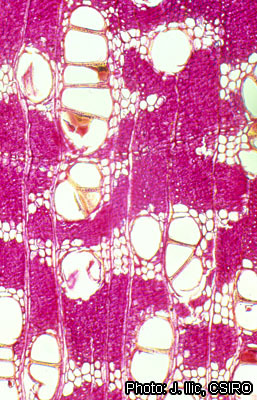 Papilionaceae (première partie). In: Robyns, W., Staner, P., Demaret, F., Germain, R., Gilbert, G., Hauman, L., Homès, M., Jurion, F., Lebrun, J., Vanden Abeele, M. & Boutique, R. (Editors). Flore du Congo belge et du Ruanda-Urundi. Spermatophytes. Volume 4. Institut National pour l’Étude Agronomique du Congo belge, Brussels, Belgium. 314 pp. Anglaaere, L.C.N., 2008. Pericopsis elata (Harms) Meeuwen. In: Louppe, D., Oteng-Amoako, A.A. & Brink, M. (Editors). PROTA (Plant Resources of Tropical Africa / Ressources végétales de l’Afrique tropicale), Wageningen, Netherlands. Accessed 14 April 2019. This page was last modified on 17 January 2016, at 16:42.